10"L x 10"W x 10H. 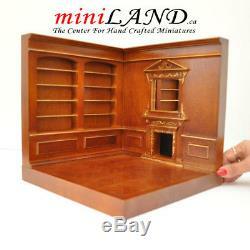 Corner roombox by miniLAND - Assembly instructions - YouTube. Video will open in a new window. 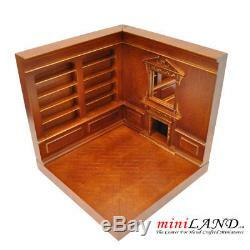 Our new corner box unit comes with one wall with shelves, one wall with a fireplace and a floor. It measures 10 x 10 x 10 inches. If you need to wire your corner box, which is, of course, optional, you can hide the wires in the back wall. Just make sure you do the wiring first. The corner box comes with 6 screws - 2 to attach the two walls one to another and the other 4 to attach the floor to the walls. This should take about 5 minutes. All the holes are predrilled and we supply all the screws. The corner box comes in two colors, white with gold impression and walnut with gold impression. 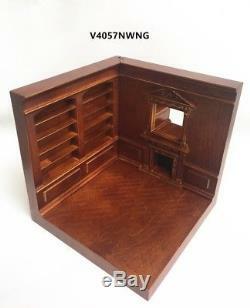 Because the box is open, with no ceiling and providing a nice background, this is a great way to display and take pictures of your best miniature furniture. So why delay, get started today because you will only find them here. 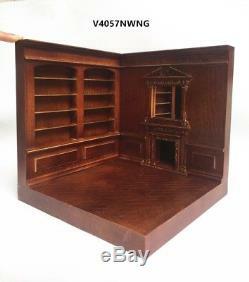 The item "Corner roombox fireplace shelves 112 dollhouse miniatures walnut- gold room" is in sale since Sunday, June 25, 2017. This item is in the category "Dolls & Bears\Dollhouse Miniatures\Other Dollhouse Miniatures". 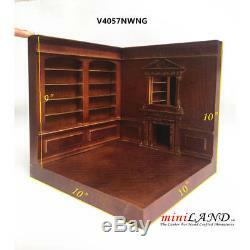 The seller is "miniland_ca" and is located in Victoria, British Columbia. This item can be shipped worldwide.